Summary: Omu is cooking up a big batch of delicious-smelling red stew, which she thinks will be “the best dinner I have ever had”. When a hungry little boy knocks on her door, she decides she’s made enough to share. Next to arrive is a police officer, then the hot dog vendor. Omu gives them bowls of stew, too. As the day goes on, more and more people come, and Omu shares with them all. When she goes to get her own dinner, she discovers the pot is empty. But she doesn’t have long to feel bad. There’s a loud knocking on her door, and Omu opens it to discover that everyone she fed has returned with a big potluck meal to share. 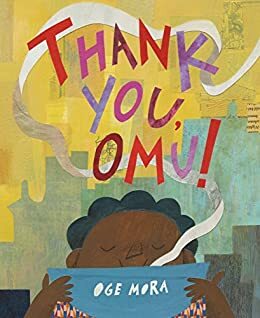 The last page shows the little boy’s thank-you card, and reads “That dinner was the best she ever had.” Includes an author’s note about her grandmother Omu, the Nigerian word meaning both grandmother and queen. 40 pages; ages 4-8. Pros: A heartwarming story of sharing and community that reads a little like a folktale. The collage illustrations show a diverse cast of characters. This would make a good holiday read, maybe pairing it with Miracle on 133rd Street. Cons: Mr. Hot Dog Vendor seems like he should be able to feed himself rather than knocking on Omu’s door for a free handout. Summary: Vladimir is making Thanksgiving dinner with his friends (a witch, a mummy, Frankenstein, and a werewolf) when some family members unexpectedly drop by. Vlad is happy to see them, but before long they have taken over on the turkey, mashed potatoes, and pumpkin pie, adding touches like eyeballs and earwax. When it’s time to eat, they decide to turn off the lights, and the family dog Spike devours the whole dinner before anyone else has a chance to get any. “You ruined Thanksgiving! !” shouts Vlad, and his family is chagrined, saying they were only trying to help. Vlad remembers they’re family, and everyone works together to make a dinner they all can enjoy. 32 pages; ages 3-7. Pros: I wasn’t familiar with Ethan Long’s previous two monster holiday books, Fright Club and Valensteins, but Fangsgiving convinced me they may be worth a look. Kids will howl with laughter at the antics of the different monsters and enjoy the gross-out additions to the traditional holiday feast. Plus there’s a nice Thanksgiving message about appreciating friends and family. Cons: It’s a pretty silly romp; you will probably want to supplement with some other books that look at other aspects of Thanksgiving. Summary: “Cherokee people say otsaliheliga to express gratitude. 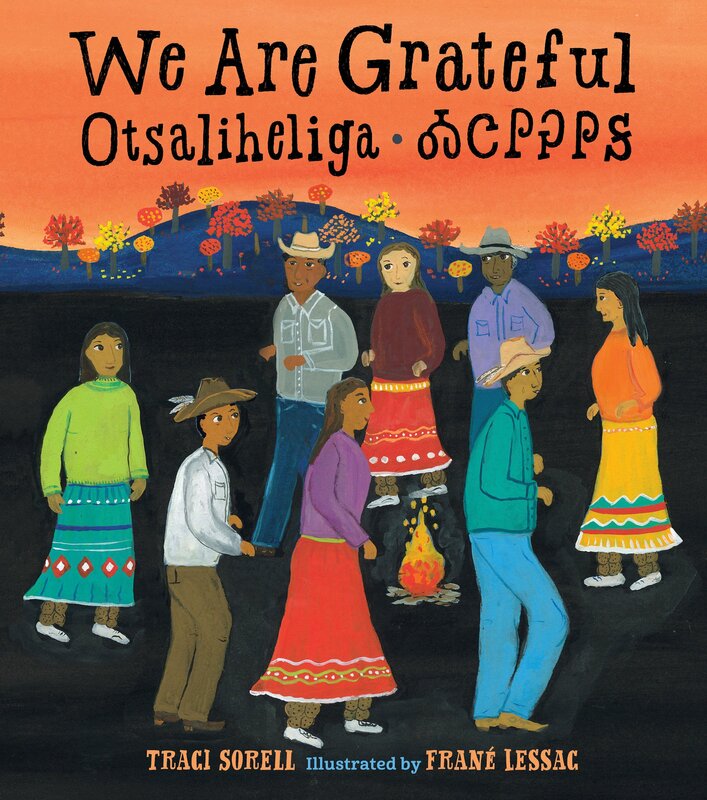 It is a reminder to celebrate our blessings and reflect on struggles–daily, throughout the year, and across the seasons.” With each season, the Cherokee people in this book are grateful, whether it is for food or community or festivals or family. People are shown creating traditional crafts, celebrating life and death, eating, playing, and remembering their people’s history and how it is woven into the history of the United States. Cherokee words and their pronunciations are scattered throughout the text. End matter includes a glossary, an author’s note, and a Cherokee syllabary with some lessons about the Cherokee language. 32 pages; ages 4-8. 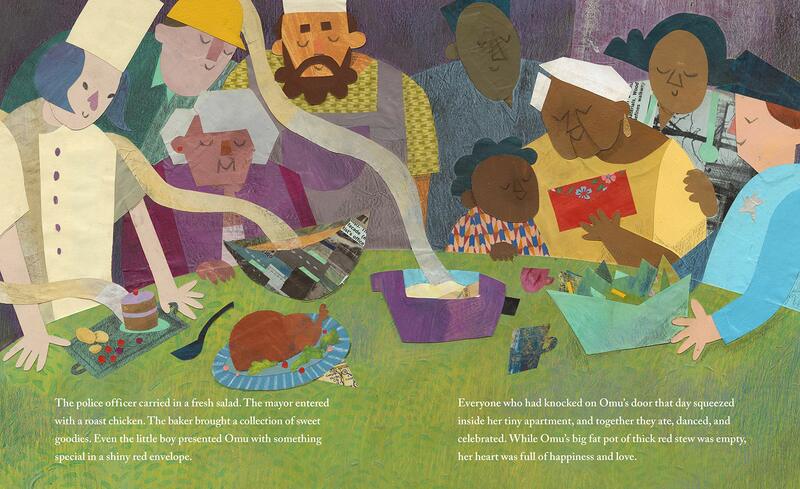 Pros: A beautiful book that would make an interesting harvest time supplement to Thanksgiving reading. I loved the bright folk art style illustrations. Cons: After studying the Cherokee syllabary, I think I can safely cross learning that language off my bucket list. 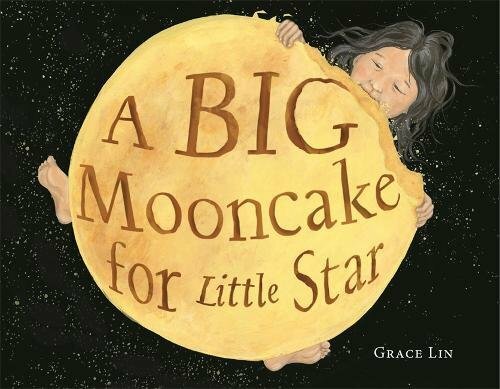 Summary: When Little Star’s mama hangs the big mooncake in the sky to cool, she reminds her daughter how long it took to make, and that she shouldn’t touch it. Little Star agrees, but when she wakes up in the middle of the night, the mooncake is all she can think about. She nibbles just a tiny bit, then hurries back to bed. Night after night, she eats a little until gradually the shape changes from perfect circle to half a circle to a crescent. And then one night, when Mama comes looking for the mooncake, all she finds is a pile of crumbs. Is she mad? Of course not…she and Little Star head off to make a new cake. An author’s note on the back flap of the cover explains how she was inspired by the Asian Mid-Autumn Moon Festival. 32 pages; ages 4-8. Pros: A perfect introduction to the Mid-Autumn Moon Festival (which is September 24 this year, in case you were wondering), as well as a loving parent-child portrayal, and a nice bedtime story. Although it’s an original story, it has the feel of a folktale. Cons: The author’s note gives important information about the story; placing it on the book cover makes it easy to miss. Summary: As pumpkins are chosen one by one to become jack-o-lanterns, Stumpkin realizes he’s not getting picked because he doesn’t have a stem. With Halloween approaching, there are fewer pumpkins in the shop and more jack-o-lanterns in the windows of the apartment building across the street. Finally, it’s Halloween evening, and even the gourd has found a home. Only Stumpkin is left. But wait! There are two black pages. Then a white triangle appears on one, and two white triangles on the next page. The shopkeeper has transformed Stumpkin into a jack-o-lantern. With a black cat on one side and a bowl of candy on the other, he is ready for trick-or-treaters. 56 pages; ages 4-8. 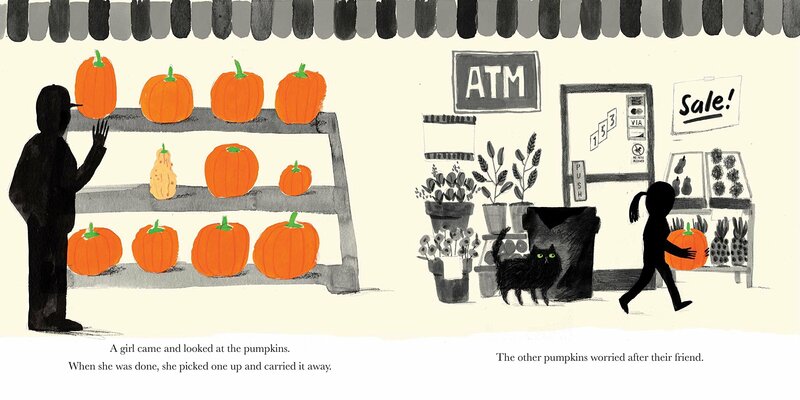 Pros: Preschoolers and early elementary kids will enjoy this Halloween tale. 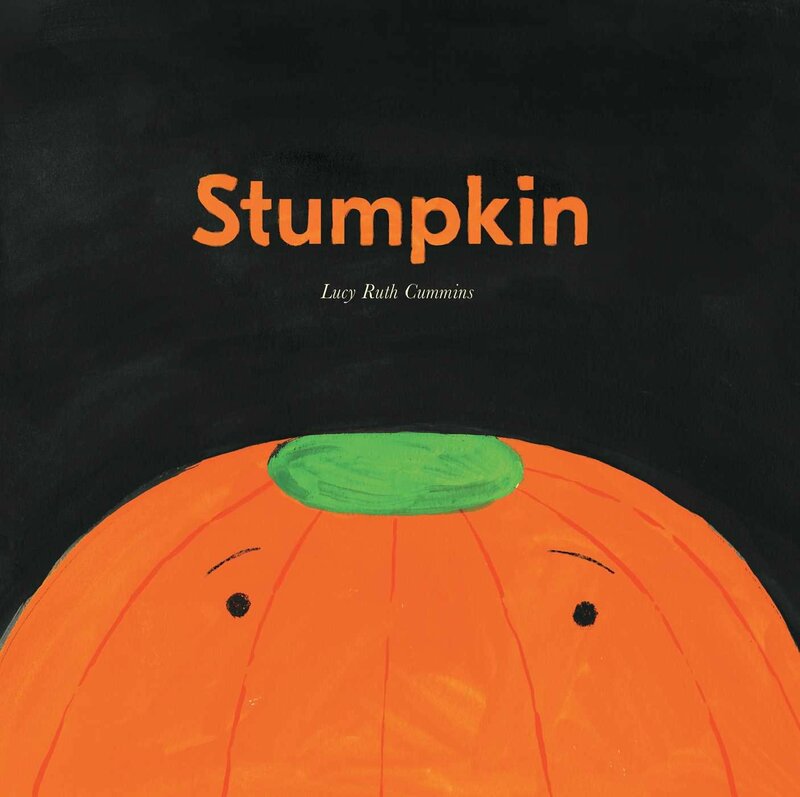 The illustrations showing Stumpkin’s change from pumpkin to jack-o-lantern are ingenious. Cons: It felt a little bit like no one wanted Stumpkin because of a physical difference, maybe not the best message for young kids. 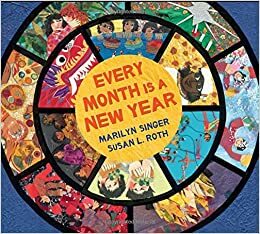 Summary: Designed like a calendar, opening at the bottom instead of the right side, this book explores how a new year is celebrated in cultures around the world. 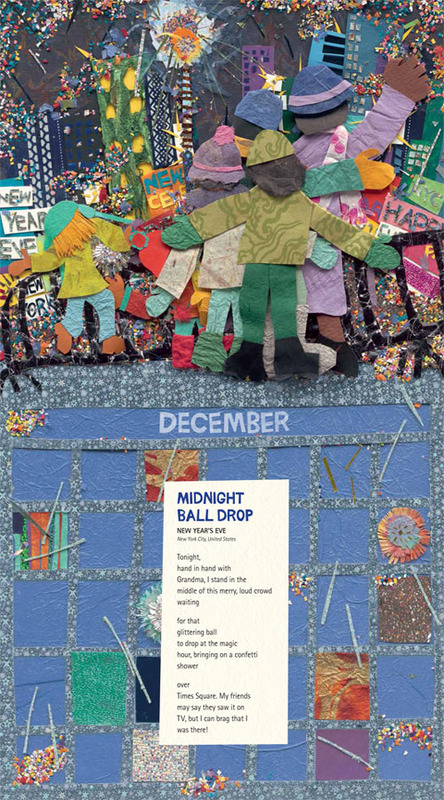 Eighteen poems celebrate the new year, beginning with “Midnight Ball Drop” on December 31 in New York City, and wrapping up with “Las Doce Uvas de la Suerte” in Spain the following December 31. In between, there are visits to Scotland, Russia, China, Iran, Thailand, Jordan, Chile, New Zealand, India, and Ecuador, and celebrations that take place in every month of the year. Includes several pages with additional information about each holiday; a glossary and pronunciation guide; and author’s sources. 48 pages; grades 2-5. Pros: A wealth of information about a wide variety of cultures, all in a clever package–a book designed like a calendar. The collage illustrations add texture and plenty of color to the poems. Cons: I would have preferred the information about each holiday to be on the page with the poem rather than all in the back. The poems made me curious to learn more, and it was a little unwieldy to have to keep flipping back and forth. Summary: A family of four sets off for a picnic in the park one summer day. The red, white, and blue napkins and paper plates, as well as the fireworks at the end indicate it may be the Fourth of July. 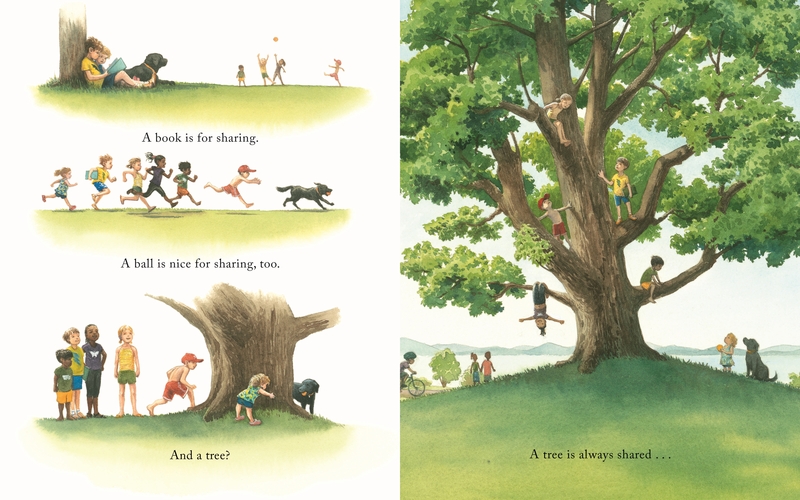 The story is mostly told in the illustrations, while the text is a meditation on sharing: “A book is for sharing/A ball is nice for sharing, too/And a tree? A tree is always shared…even when you think you’re alone.” What can be shared can be as abstract as time or as concrete as a towel, warmed by the sun. The book comes full circle with the final lines: “Many can share one light./And a blanket? A breeze? The sky? 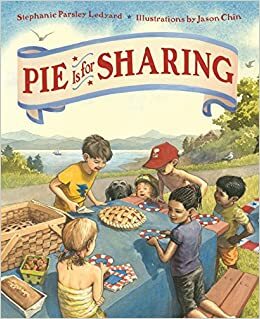 These are for sharing./Just like pie.” 32 pages; ages 3-8. Pros: This book really grew on me; both the text and the illustrations are deceptively simple. My favorite page shows eight smiling kids (and their dog) of different races, genders, and sizes standing around a sparkler that says, “Many can share one light.” A perfect book for sharing on the Fourth of July or any summer day. Cons: The sad picture of the littlest girl looking for a piece of pie and finding only an empty tin.